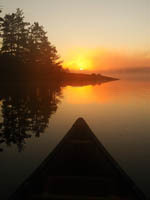 Just got back from a trip NW of Chapleau. 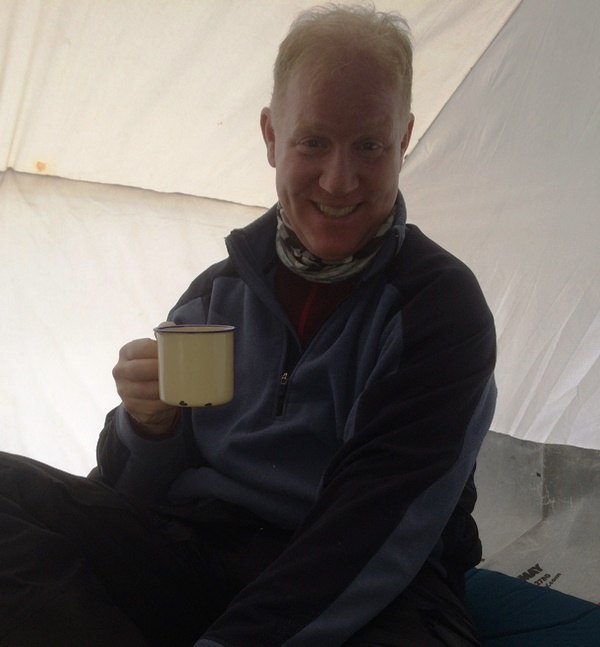 Interesting to hear Scouter Joe's remarks that there was rain for 3 days at Deep Freeze. We had one afternoon of freezing drizzle, which became snow again by suppertime. I guess you have to go to a latitude of 48N or so in Ontario to avoid liquidity in the warm fronts. We had a standard Budd Car trip. All went well with the train. 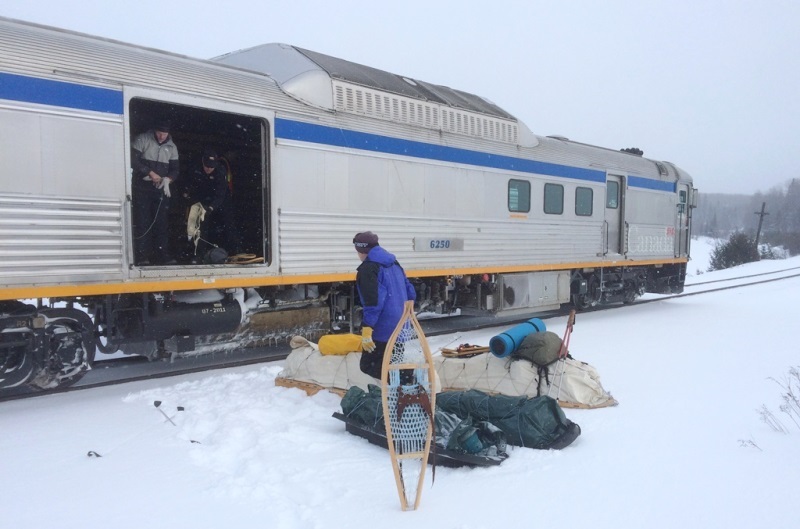 The Conductor, Curtiss, was very helpful and friendly -- lives in Barrie and commutes to Sudbury. We left the station on time, but were 1.5 hours late due to waits at sidings by the time we got dropped off. There were about 2 hours of daylight left. Three guys, 8 days, no plans except for a general idea about a round-robin route to pick up the train at a different place later. We set up the tent for the first night even though we planned on moving the next morning -- it was -20C or so, and for one of us this was a first. 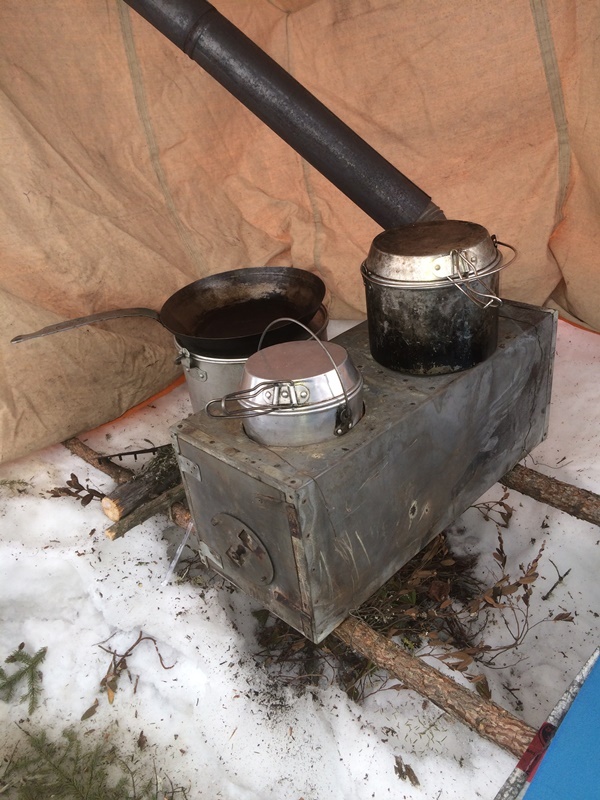 Since we were only there for an evening and breakfast, I made a quick set-up for the stove, simply wiring it to 2 green sticks and setting it on the snow. ... and pack up and on the trail again. I don't have the photos from my partners yet, but it was fairly tough hauling. (Why do we always bring too much stuff? And too much frozen meat?) The wind was in our faces and it was grey and snowing. 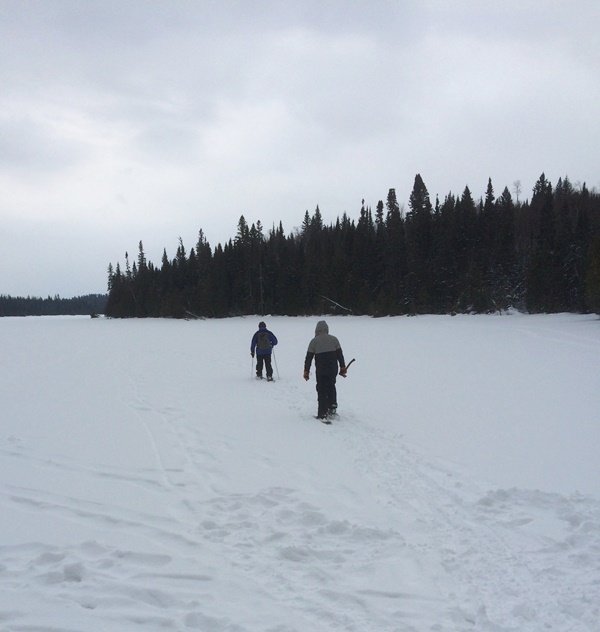 But there was no slush on the lake and we were able to slog ahead without pre-packing a trail -- bonus, of course. 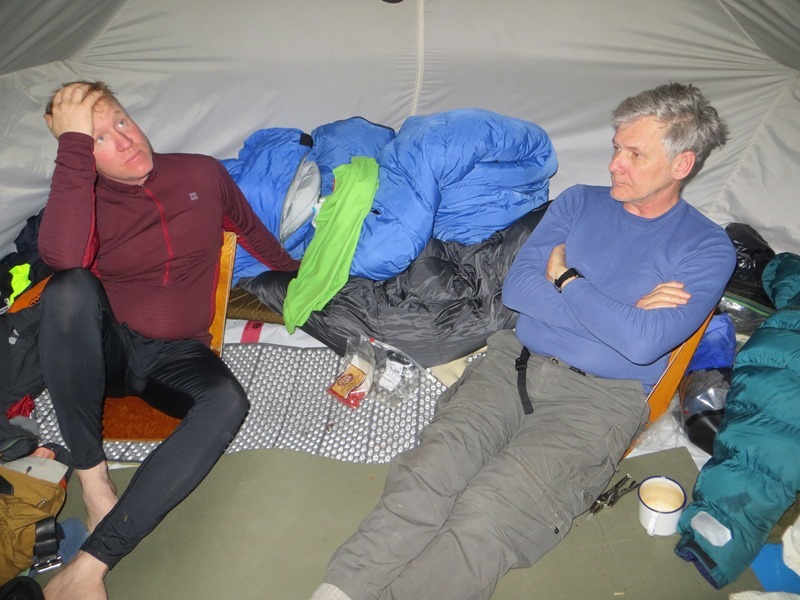 Camp for 3 days... taken next day in the sunshine. Last edited by Dave Hadfield on March 7th, 2017, 2:37 pm, edited 1 time in total. Then day-trips, some nice, some not so nice. Here's a walk to a dead-end bay of the lake. 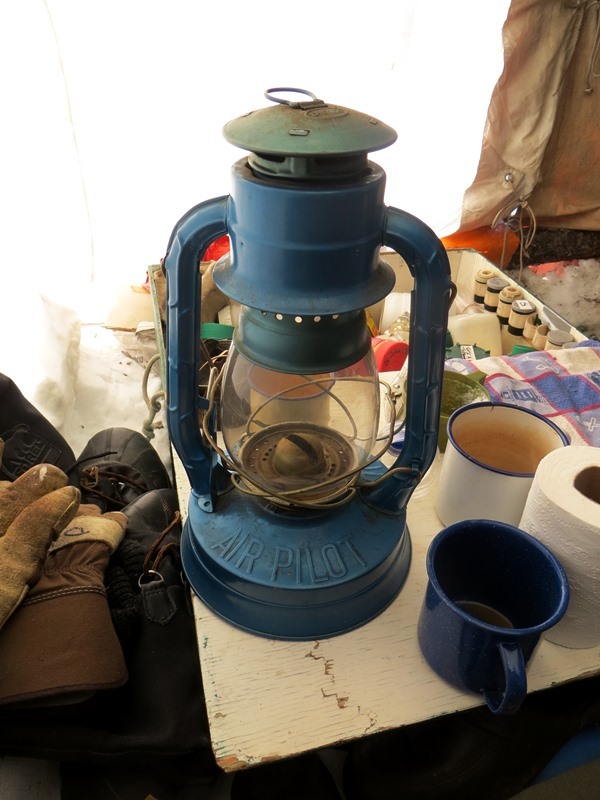 Where, since the materials were at hand, a quick brew-up was made in the snow. Tea and toasted sandwiches. And cookies! Then back for evening chores, and yet another fire! 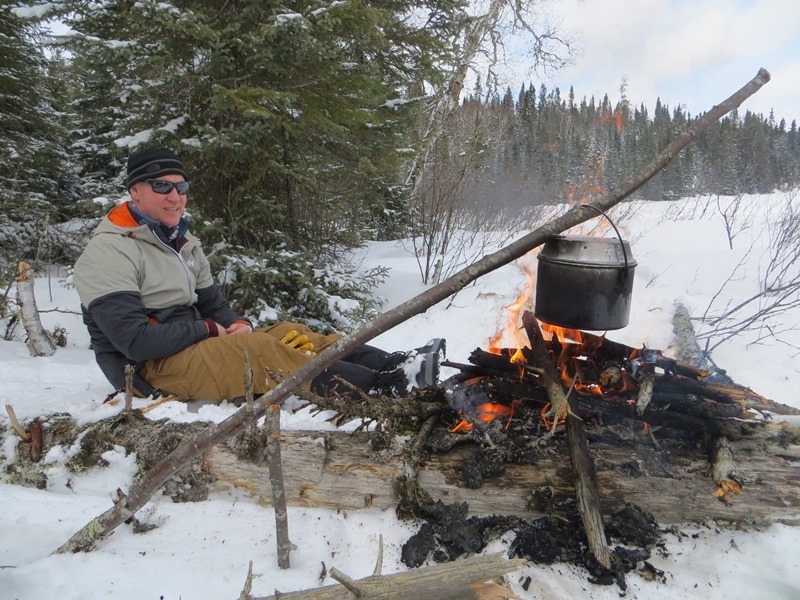 Thanks for sharing, Dave ... looks like a great winter wander! Nice to see thanks Dave. 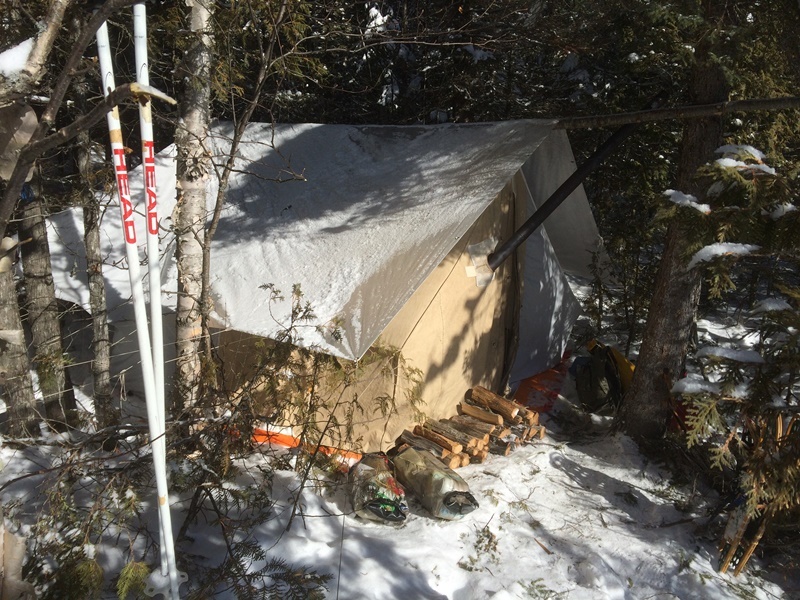 I've not done a grand total of one night of winter camping but hoping to do more. 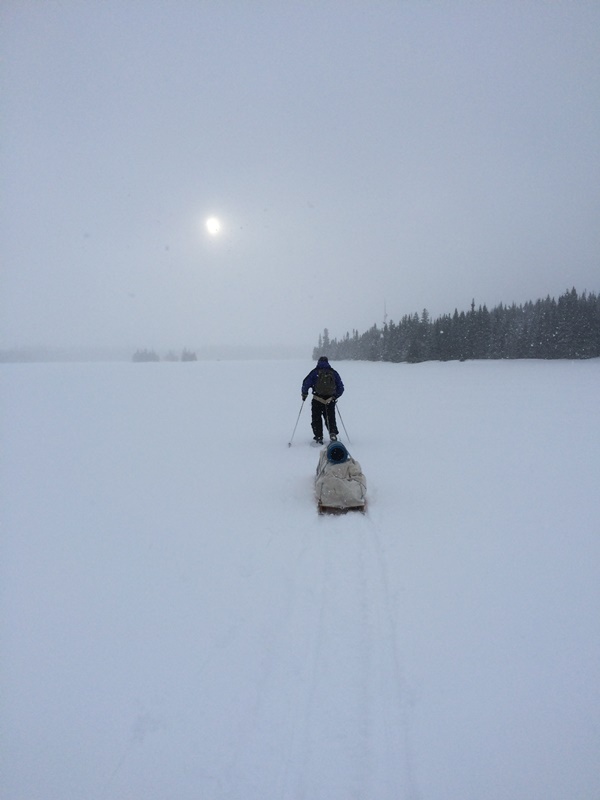 Couple questions for ya....Do you ever use goggles or find them helpful in really cold or windy days? Also do you do anything different for pants? Nice longjohns aka baselayer gotcha, just wonder if there's something else to it. 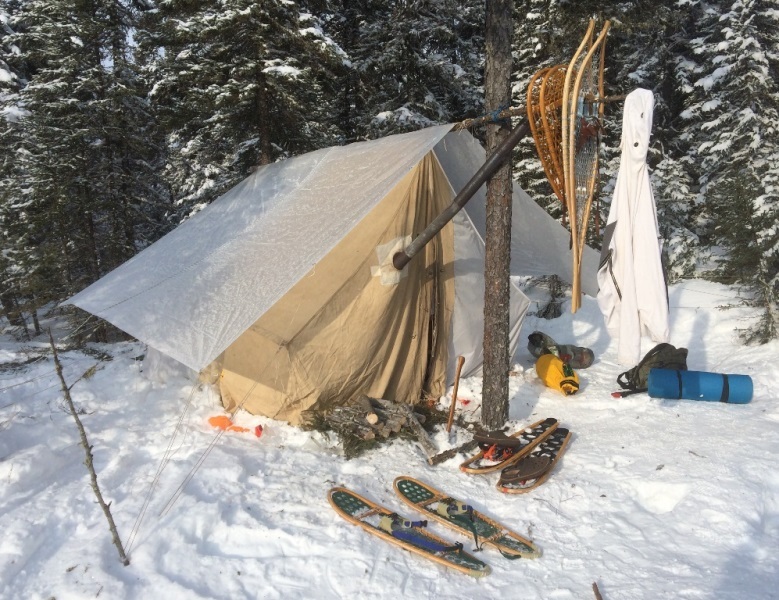 Ah yes a cot off the snow I suppose? I was interrupted -- you go away for a while and things crop up! More photos in a bit. Goggles? No, instead I prefer a deep-cowl hood on my anorak. A tunnel-hood. This creates a dead-air space in front of your face which deals with the wind, but also conditions the air that you breath -- your outgoing breath deposits warmth and moisture on the rim of the hood, which the incoming air picks up. You do, however, need sunglasses if walking south on the ice on a bright day, to avoid damaging your eyes. If it's cold, and you are walking into the wind, and your face is exposed, and you feel the need to wear goggles, you'll probably frostbite the skin of your cheeks and chin and nose. A deep hood prevents this. BTW -- all store-bought hoods that I've seen lately are no good for this. They are cut away at the sides so that you can see cars when you cross the street. But for an ice-walk, it's best to make an extension that you can button-on. Pants? I wear poly long johns top and bottom. The top has a turtleneck, but no zipper because that is very cold when walking into the wind. My pants are whipcord wool -- a wonderful fabric. It cuts the wind but it breathes. It also dries fast. And it doesn't melt when your knees are 12" from a lunch fire. Mine are old surplus army officer's pants. 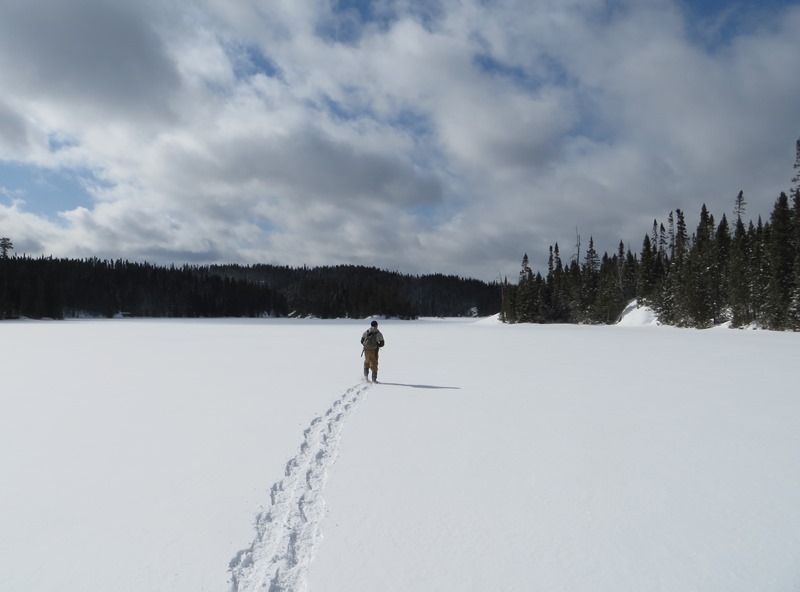 But for cold into-wind lake crossings, I have a nylon wind-pant, unlined, with full side-zips so that I don't have to take off my snowshoes to put them on. You don't want a cot. Snow is warm. That's why mice do so well in winter. 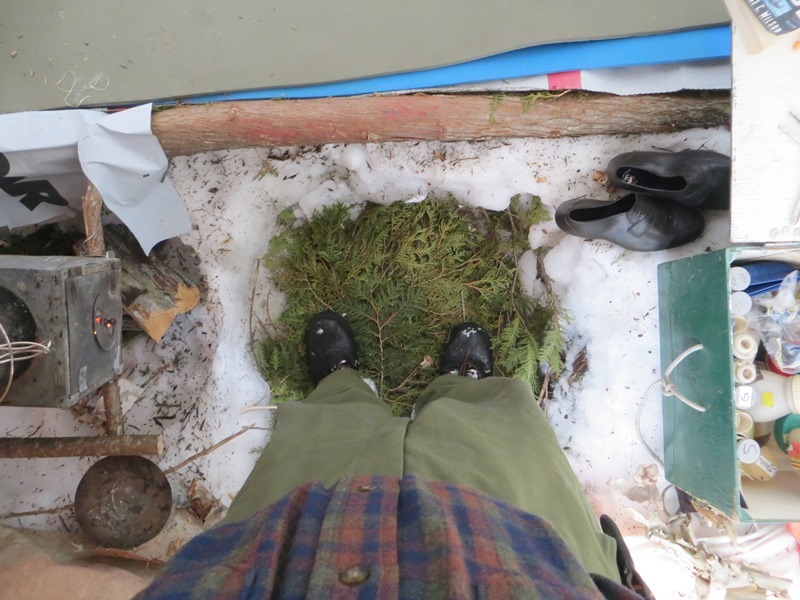 Snow is usually about -5C in the boreal forest. It's much warmer than the night-time air. 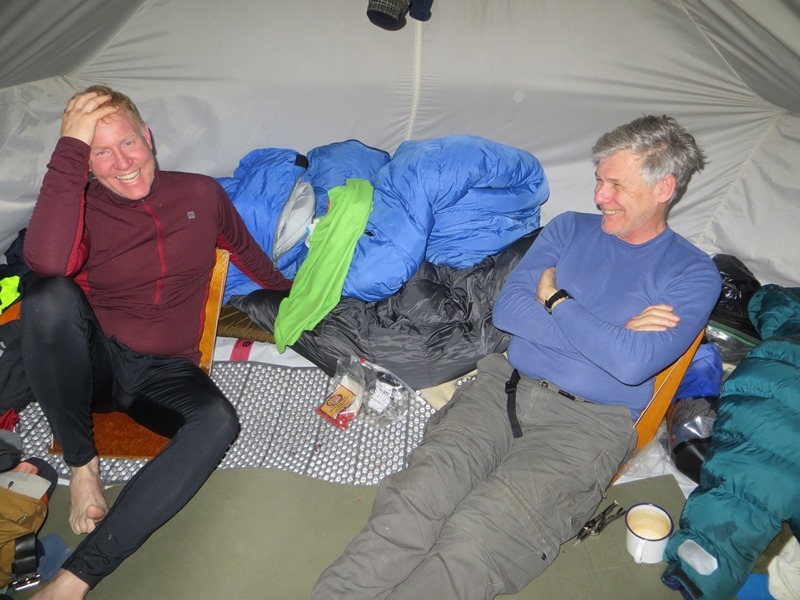 We sleep on a ground sheet of Typar, a foamie, and a thermarest. No hint of cold comes up through this. Plus, it's lightweight. This day-trip occurred on the freezing-drizzle day. 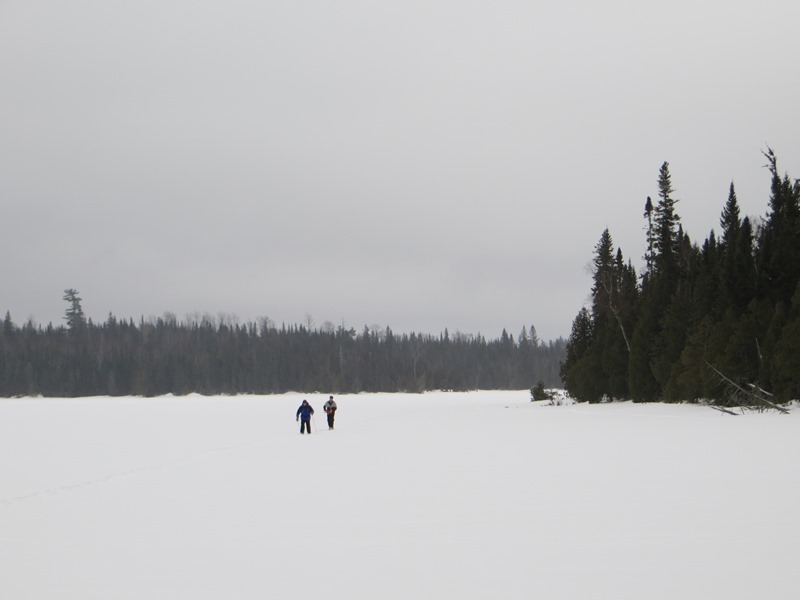 The 2 gents left in decent conditions to scout out the trail to the next lake. 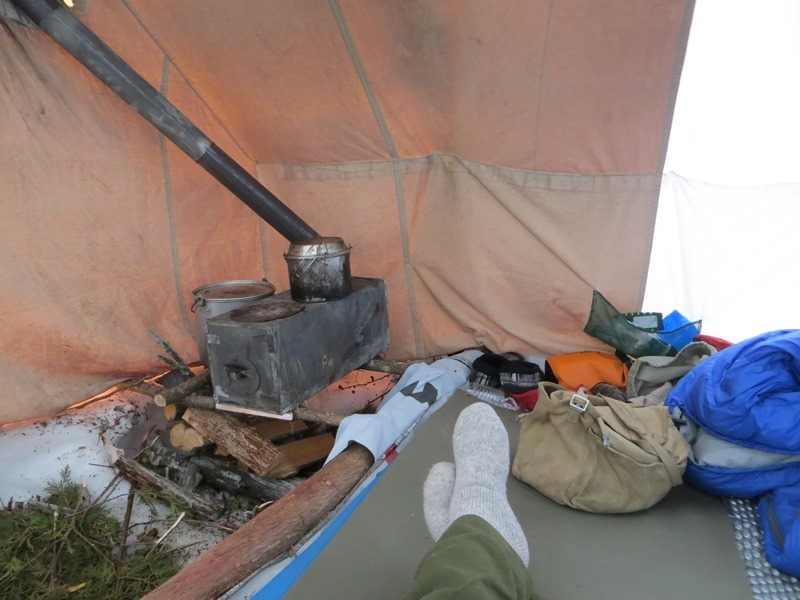 I stayed in camp to putter about, cutting firewood, having a wash, making minor gear improvements, etc. You know, people ask when you go on these trips: what do you do there? Hunt? Fish? The answer for me is, "Sometimes... nothing." And I like that very much. I had planned to put a hole through the ice and wash some minnows. Honest. But when it started to rain I made a pot of tea, read a book, and smoked my pipe. ... soon turned (in the heat of the stove) to happier ones. 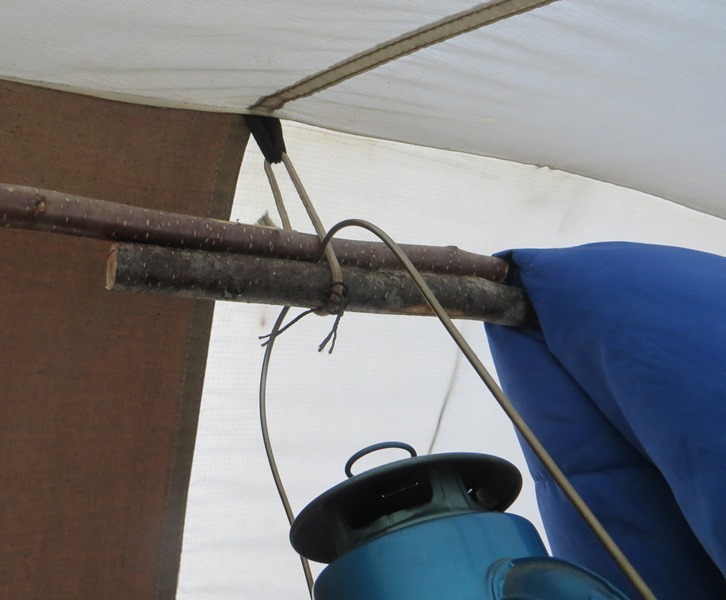 There are 2 drying-poles in our set-up. This one is at the front, and is often where the small bits end up. 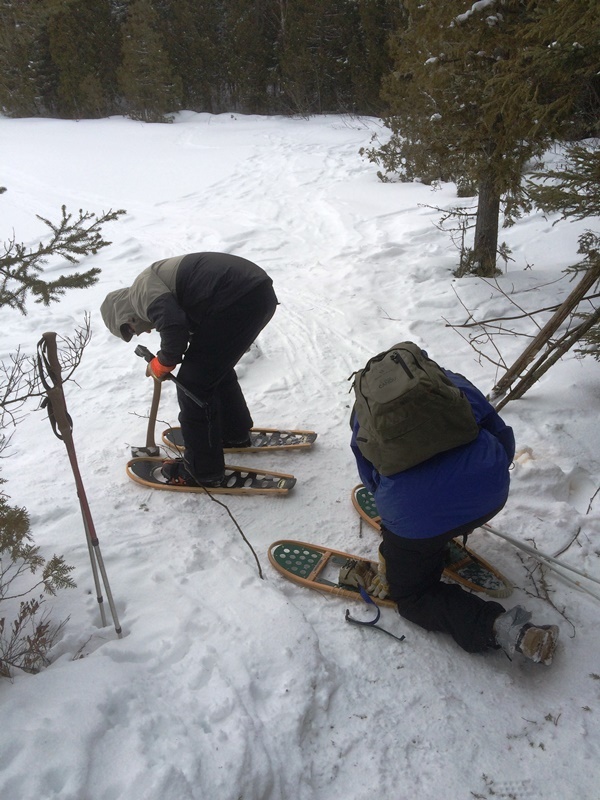 The plastic-decked snowshoes were not very good in the heavy wet snow. True, they didn't absorb water and sag like babiche rawhide weaving, but they picked up a heavy load with each step and did not discharge it. Very hard on the feet and legs after a couple of hours. I liked them a lot. I love the Huron pattern for trail use (and bring a set of Bearpaws for camp use), and the monofilament gave enough loft with lightness. I had no breaks or cuts. The nylon and fastex buckles on the modern shoes were also a problem. 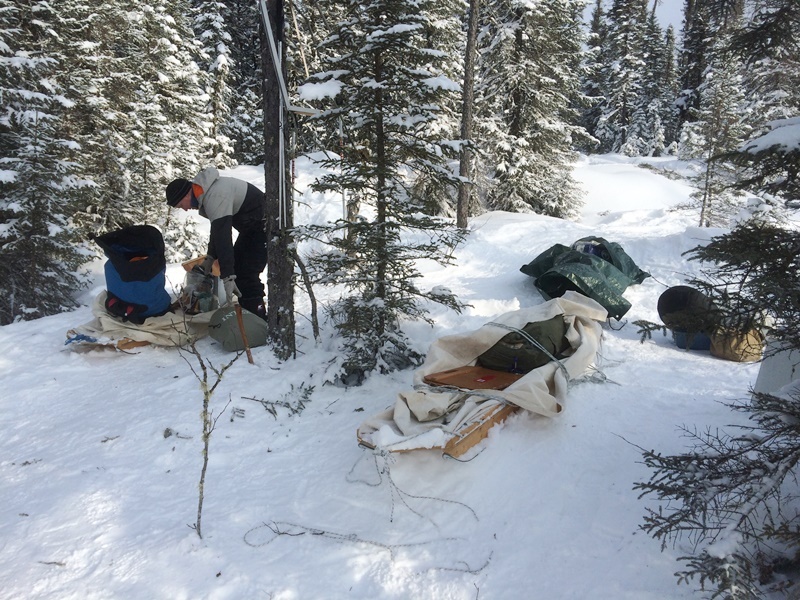 The nylon was very stiff in the morning cold and always required at least one readjustment after initial use, and one of the buckles broke after a -34C night, and had to be repaired using a sewing kit and robbing a buckle off a pack. The leather bindings I use have all been repaired at various times, but it's a simple task -- even enjoyable, in the evenings, if you have an awl, waxed twine, big needles, and a pair of pliers. 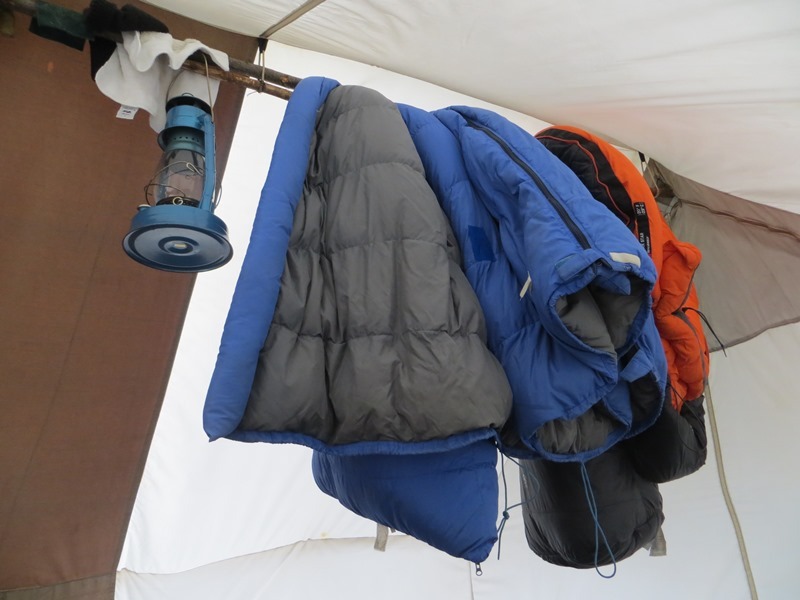 This is generally what's on the other section of the drying-poles. 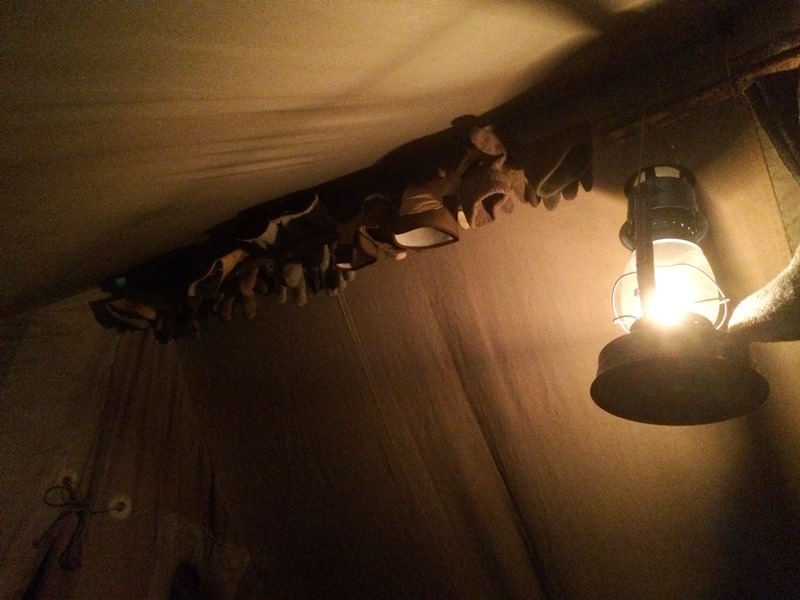 After years of listening to a Coleman hiss all evening, we very much prefer a GOOD wick lantern. Not a cheapie. True, it's not as bright, but it's quiet, produces about 12 cp, and thus is quite strong enough for general purposes. And it's QUIET. 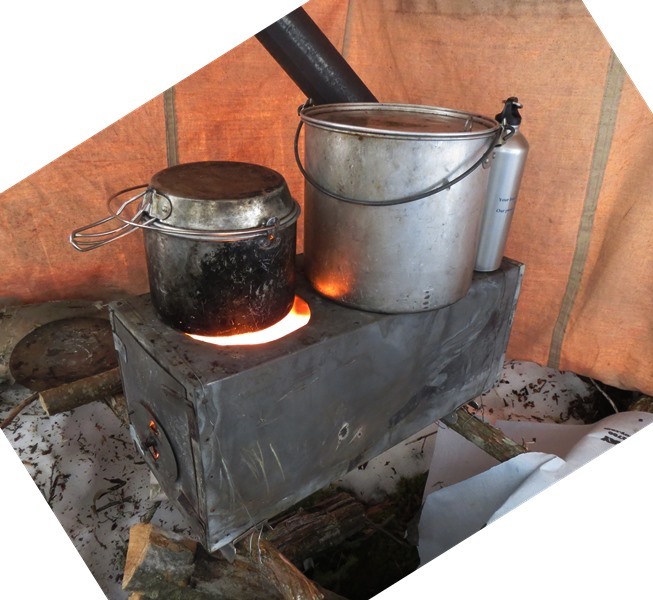 It also only burns about 1/5L, or less, per night. This is how we mount it. 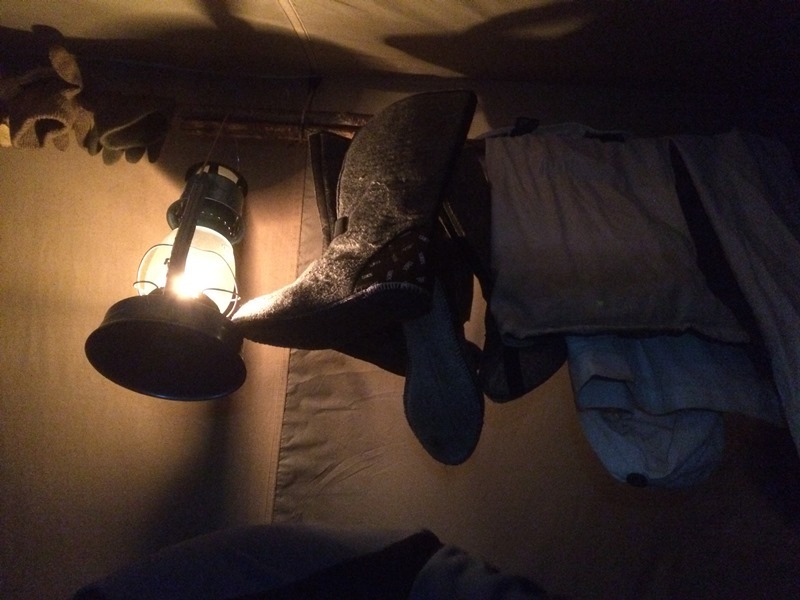 Great winter wander report..love the photos... what is the fuel for the lantern? Thanks for the info Dave. It's looking at a different world. We have had a couple dustings but I've not touched a snow shovel since January here in London. The cold then warm comparative photos are a hoot. Al, it burns lamp oil (good kerosene). I bring a funnel so that I can pour unused oil back into the bottle for moving -- the lantern will leak if pitched on its side during the day. I made a container for it: a cylinder of that very light aluminum you buy at Canadian Tire for auto-body repair, with a wooden plug in the bottom and a wooden lid. It isn't watertight. Other photos... here's the Service Nexus of the camp: The Grub Box, and the photo is taken of a totally normal midday appearance, unstaged in any way. It is lightweight -- made from 1/4" spruce plywood. It hardly weighs any more than a heavy nylon pack. (Most grub boxes I've seen are of 1/2" ply, which is pointlessly heavy.) 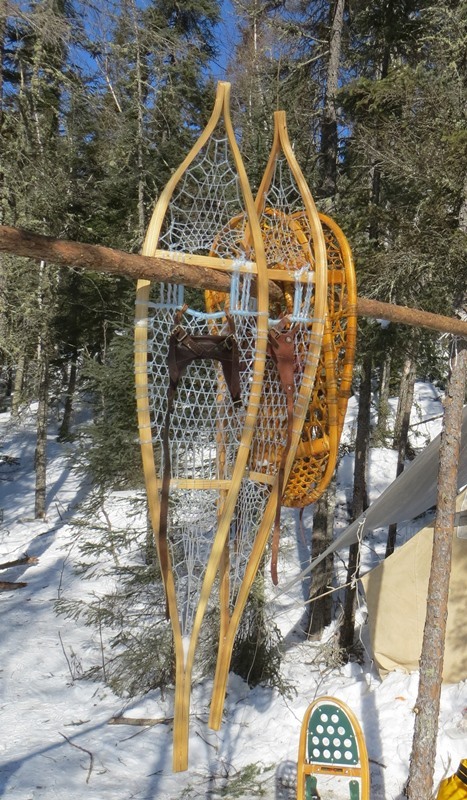 The lid is held up by a stake in the snow, and gives an instant table. The film-can rack are spices. All the goods are dried, in light plastic bottles, and labeled so you can spot them from above. The compartment in the corner is for cutlery. And it carries no more than 3 days food, so it is not too heavy to move around -- and so that all the food is not on one sled. It is set up in our tent to the right of where you step in. 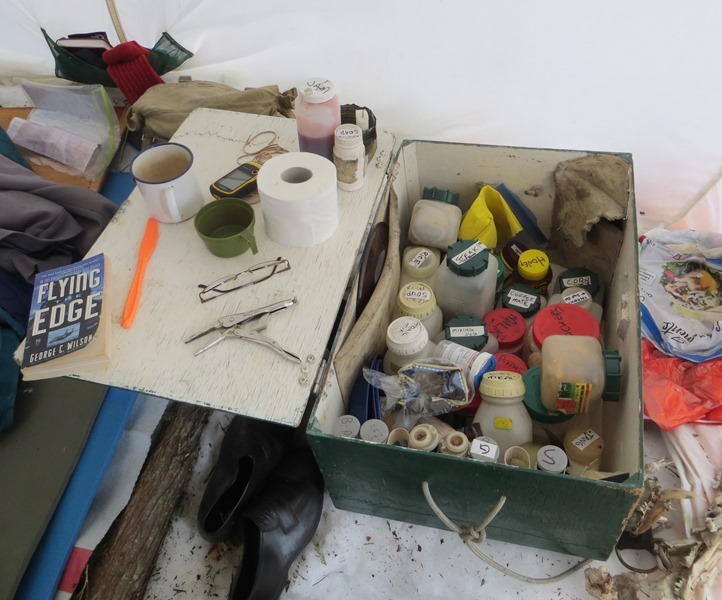 This is the working area of our tent -- stove to the left, grub box to the right, and raised sleeping-area beyond. So strikes me your rectangular tent is well suited to hanging stuff up to dry. I've seen the middle post sort of teepee style at a show lately and while it looks maybe easier to set up your rectangle one seems more practical. Great report so far Dave, thanks!